BHRT stands for Bio-Identical Hormone Replacement Therapy and is an advancement in the treatment of symptoms associated with hormonal declines. Common complaints of patients with hormonal imbalance or decline can include fatigue, hot flashes, sleep disturbance, decreased libido, irritability and mood disturbance, and weight gain. Dr. Cole-Sedivy and her skilled staff in Columbus, Ohio take a very thorough and comprehensive approach to hormone evaluation and replacement individually evaluating not only estrogen, progesterone and androgen levels; but also looks closely at cortisol, thyroid, DHEA, and overall wellness ultimately aiming to provide individualized treatment plans and recommendations that minimize symptoms while optimizing hormonal balance and safety. The precise components of each person's therapy need to be determined after physical examination, medical history, and laboratory testing are considered. Close monitoring is essential to ensure that appropriate dosage adjustments are made. 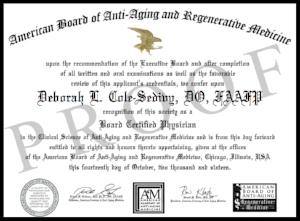 Dr. Cole-Sedivy is Columbus, Ohio located and board certified in Anti-Aging and Regenerative Medicine by the American Board of Anti-Aging and Regenerative Medicine. Learn more about personal hormone testing! * Every patient is special and unique, and treatment results may vary from person to person.